"I thought you were going to be a terrorist," the translator said, clutching my arm as we emerged from the chambers of Judge Ismael Moreno in Spain's Criminal Court. Just after Christmas, I travelled to Madrid to ratify a report connecting the chain of command in China's Communist Party government to oppression in Tibet. In some of the cases she'd worked on, the translator said, terrorists or hardened criminals went down on their knees in front of the judge and denied everything. Cases of universal jurisdiction have been pursued in Spain ever since a group of progressive Spanish lawyers put together a lawsuit against Chilean dictator Augusto Pinochet, who presided over a 17-year reign of terror and ordered foreign assassinations. Pinochet's arrest in London in 1998 was the result of a year-long struggle by prosecution lawyer Carlos Castesana and Madrid judge Baltasar Garzón to bring Pinochet to account for the brutality that followed his overthrow of the government of Salvador Allende. * Kate Saunders is the Communications Director of International Campaign for Tibet. 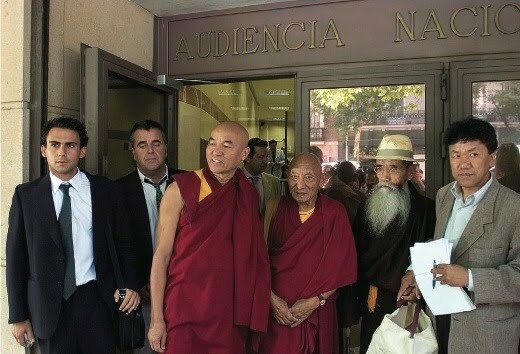 Originally published in the Sunday Guardian at http://www.sunday-guardian.com/analysis/spain-hears-tibet-lawsuits-upholds-universal-jurisdiction; republished in TPR with permission of the author.